As heads of one of the leading real estate families of New York City, Paul and Irma Milstein established the PIM Foundation in 1994 as a successor to the Milstein Family Foundation. In keeping with those priorities, the PIM Foundation concentrates on New York City Institutions, with a primary focus on culture, medical research and Jewish communal organizations. 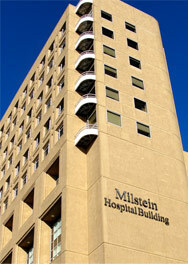 The PIM Foundation is a successor to the Milstein Family Foundation, and is privately owned and funded. We do not accept applications for donations or donor gifts. If you have a general inquiry, please email us at contact@PIMfoundation.org. Paul and Irma Milstein, Howard and Abby Milstein, and U.S. Senator Chuck Schumer at the opening of the Irma and Paul Milstein Division of United States History, Local History and Genealogy.